For this blog post, I wanted to review one of my favorite prices of gear: my compact flute stand! I bought this stand off of Amazon awhile ago and I have been loving it ever since! I will put some pictures of the stand at the bottom. This stand is awesome because the stand folds up and fits right inside the foot joint: C-foot or B-foot. That means it doesn’t take up any extra room in your flute case! The stand comes with instructions on how to open it, but after the first time, it becomes almost intuitive. 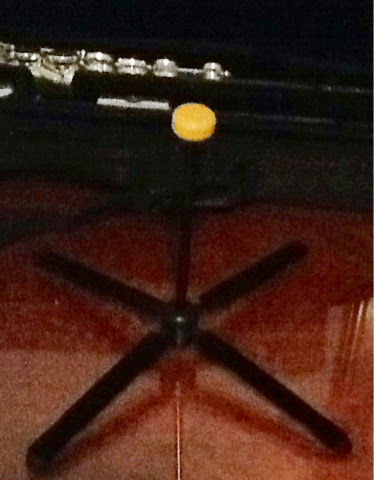 I love using this stand when I am at school in a practice room or in band class, that way, I don’t have to worry about setting my flute down in a place where it could fall or get damaged. If there is one thing that is wrong with it, that would be the fact that one of the legs is a little loose when setting up and taking down the stand (but it is fine when it is all put together). Have you tried this stand? What are your thoughts on it? What product or type of product should I review next? Let me know in the comments!